Pirates of the Burning Sea has announced that it will soon join the swelling ranks of free-to-play MMOGs. Free-to-play is all the rage these days, and why not? The charred plains that lie between the World of Warcraft behemoth and the EVE Online niche are littered with the broken corpses of games that tried and failed to make a buck through conventional subscription models. And with Turbine crowing about its F2P success with Dungeons & Dragons Online, it appears to be an increasingly attractive option for many MMOG studios. Pirates of the Burning Sea, which debuted in January 2008, is the latest game to roll the dice with the no-subscription model. Flying Lab Software made the announcement yesterday, although the studio claimed the decision had actually been made near the end of 2009. 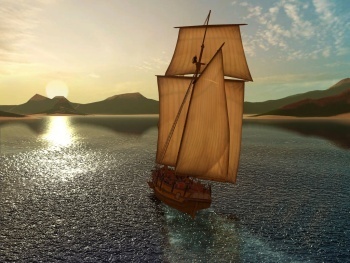 The free version of the game will give players "the complete PotBS experience," with a few limitations to things like character and dockyard slots. Microtransaction-based upgrades and items will be available for purchase, while subscriptions in the form of the "Captain's Club" will still be available to serious fans, offering experience bonuses, better loot chances and other extras. "Captain's Club members and anyone who has ever subscribed to PotBS will automatically have access to every account upgrade that free accounts do not have (i.e. character slots, structure slots, dockyard slots); we don't want to take anything away from the players who have supported PotBS since we launched," the studio said. "The bottom line is that we want to offer the game to everyone for free while still making sure that our current and former subscribers are recognized for their support." Flying Lab didn't reveal when the free-to-play changeover will take place but said "all the necessary tech is completed and is in testing, and we're very close to starting the countdown." Want to buckle some swashes on the cheap? Find out more at burningsea.com!